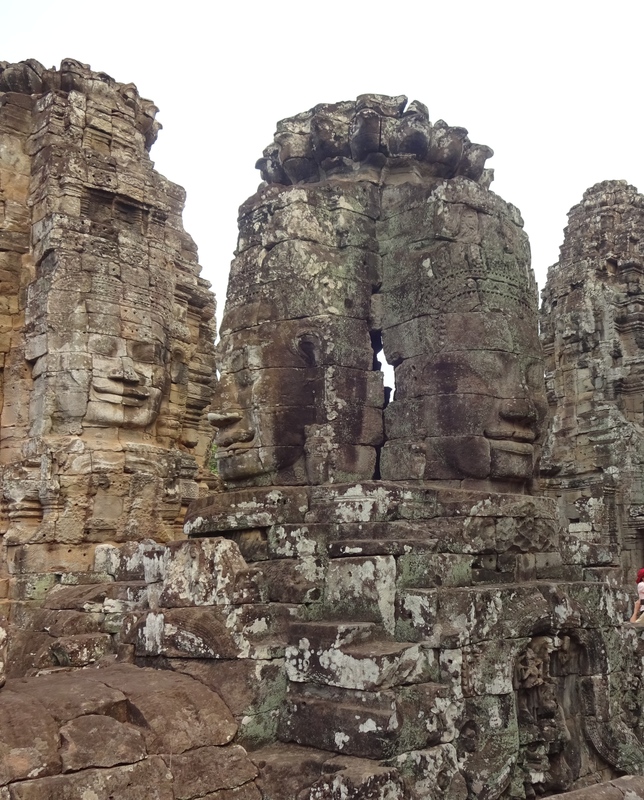 I am already fascinated with Cambodia. The people, the ambience, the art, the history–all distinctive, fresh and intriguing. From the first moment of landing, I was not in Just Another Asian country. Immigration is always a fun house. This was no different. In addition to my luggage and daypack, I was carrying a red Whole Foods bag with some items I had left over from Laos- bananas, nuts, a sandwich I had brought for lunch on the flight. I put it up on the counter as I presented my visa application. One of the visa officers asked me what was in the bag. I said food. “Do you have any cookies?” he asked. “Why yes, I think I do.” I replied. “You certainly may.” I handed him a cookie. There is only one company that is authorized to run taxis from the airport. I was escorted to a Lexus SUV by a sharp, young, hip and handsome english-speaking Cambodian driver, who proceeded to hustle me in the most subtle and effective way as he drove slowly on the “highway” all the way to my hotel. He was a marvel to behold. By the time I had arrived, I had arranged a driver and a guide for the entire next day, starting at 5am, at a price quite beyond what I had imagined I would pay. He even asked what I might be doing that night and would I enjoy the company of a local female. I told him I would not be burning the candle at both ends, thank you. But rise at 4:30 I did. And get on the road at 5, we did, with the driver and a 22-year old certified tourist guide. 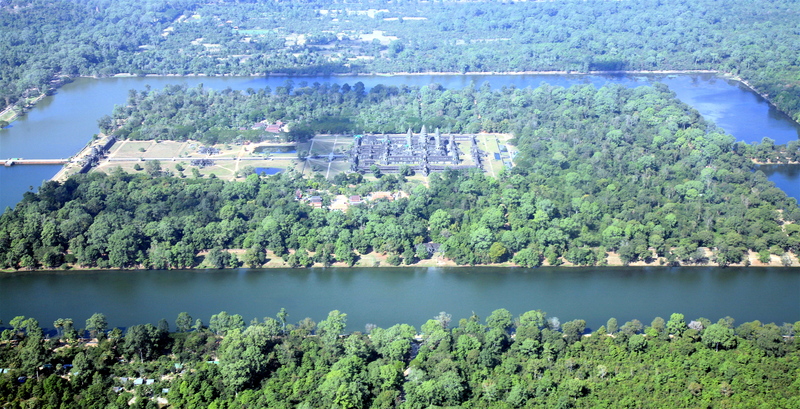 It’s not far to Angkor Wat, and by the time we were getting close, the tuk tuks were bumper to bumper in the darkness all the way to the parking area. 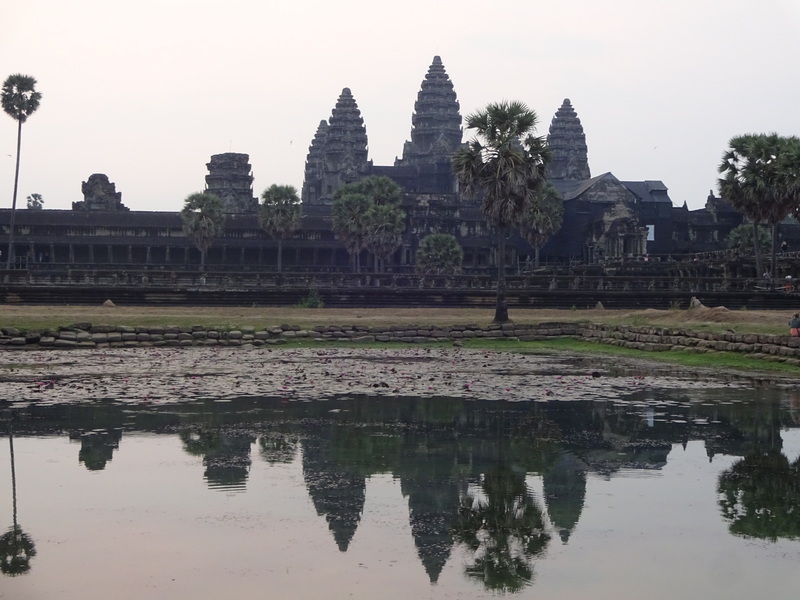 We all walked along a bridge across the 200m moat and climbed stairs up and into the complex, filtering over to the small lake where the de riguer Angkor Wat sunrise shot will be taken. (Footnote–the perfect shot from across the lake of the sun rising directly over the middle tower only occurs during two months of the year: March and September). Except there are at least 300 people from every corner of the world already there, each positioning for the signature moment of perfect solitude we all dream of. And if we take enough pictures in the dark, perhaps we can make that sun rise sooner. It was like watching water boil. For an hour. But I got the shot. Didn’t I? 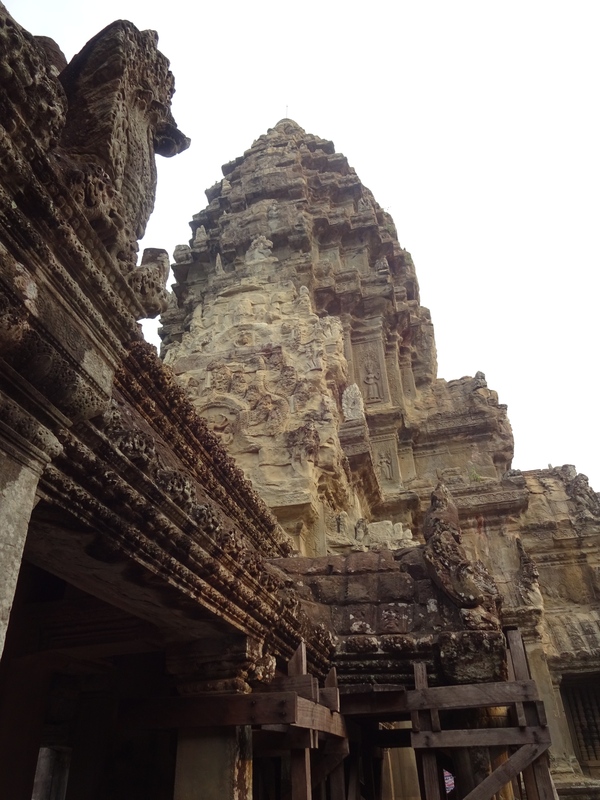 The rest of the tour of Angkor Wat was with my personal guide, navigating large Chinese and Indian groups, waiting patiently for an Apsara official to permit access to the central tower and browsing the extensive system of hallways. 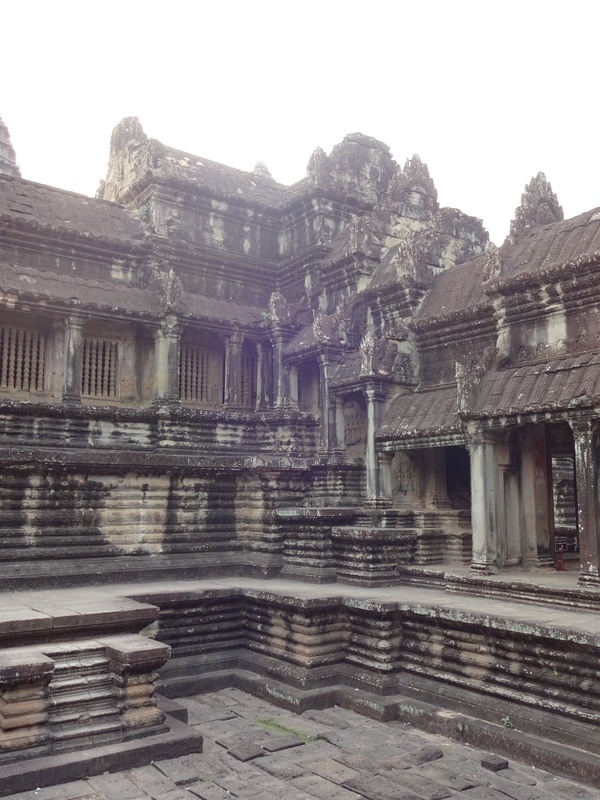 This 900 year old complex was built as a temple for a king, a Hindu king, who became a Buddhist and who was followed by later kings who were Buddhist. 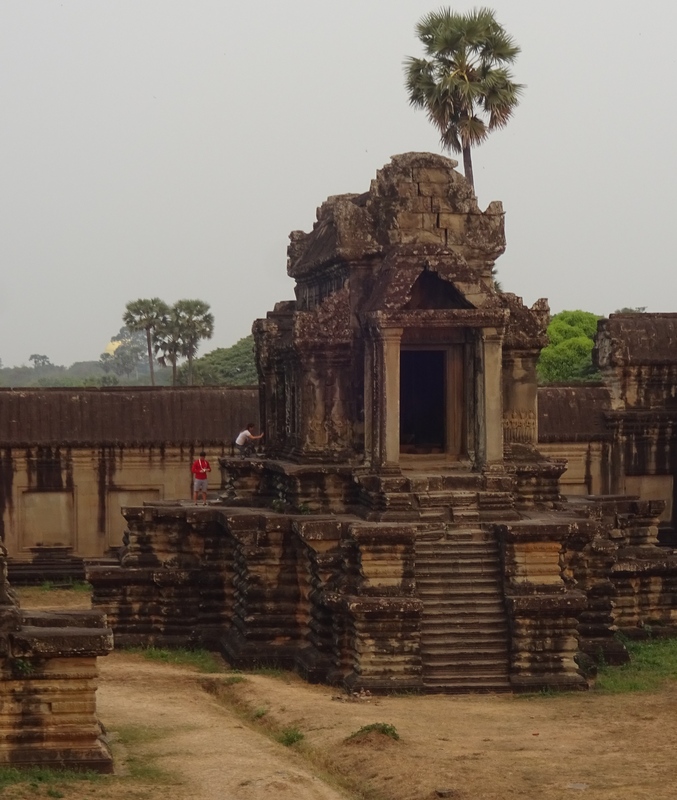 This great Khmer king, Suryavarman II, took it upon himself to relieve the suffering of all people, building hospitals, residences for the elderly, introducing irrigation systems and new technologies learned from afar. It is a fusion of Brahman and Buddhist devotion. 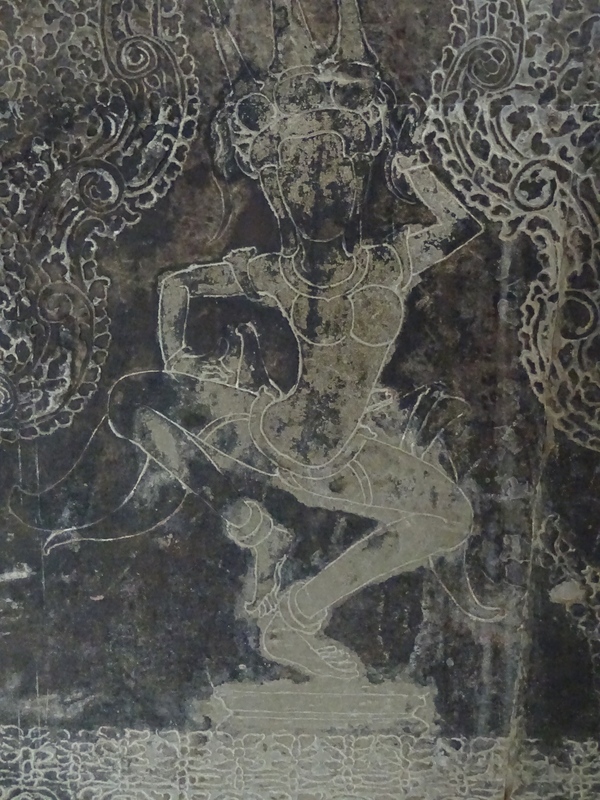 While the Mahabarata is portrayed on the walls and the carvings and towers either honor or include various depictions of Vishnu, Shiva and Brahma, there are images of Buddha inside the uppermost meditation chambers. 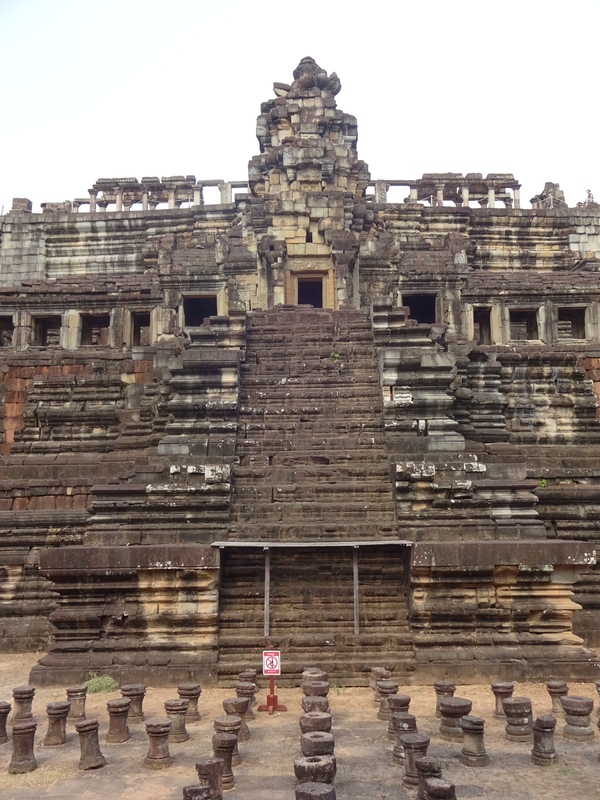 Mahayana Buddhism was integrated further into Khmer culture in the late 12th Century. Indra, at the top, creating the world. Anyway, it’s massive. It’s awesome. It’s an engineering marvel, designed to symbolize the mythic universe, with Mount Meru being the central tower, the outer walls being mountains at the end of the world and the moat being the cosmic sea beyond that. 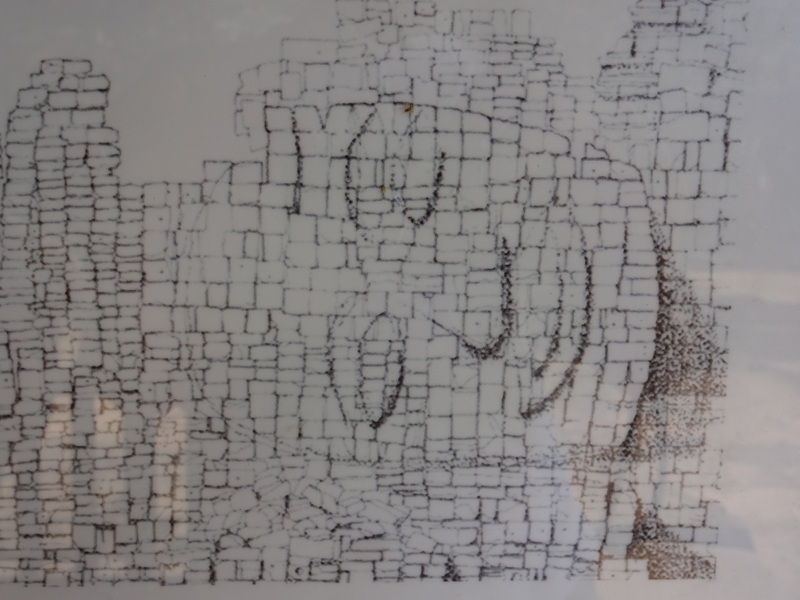 It was built with a core structure of volcanic rock transported from 60 km away, overlaid with carved sandstone. It’s everything it’s advertised to be. What a treasure for the world and the people of Cambodia! Just for perspective, the moat is 200m wide. 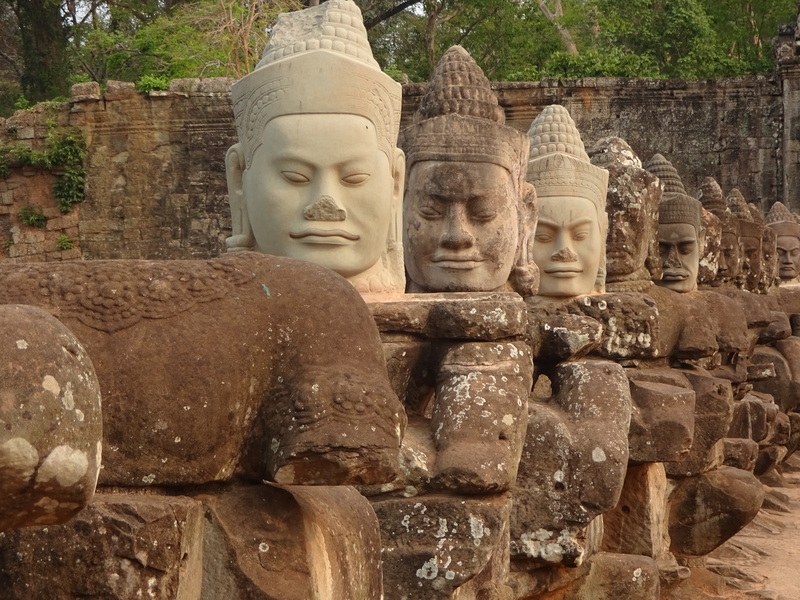 Moving on, we headed to Angkor Thom, which was really a walled city built by a succession of Buddhist kings housing multiple temples. I saw two. 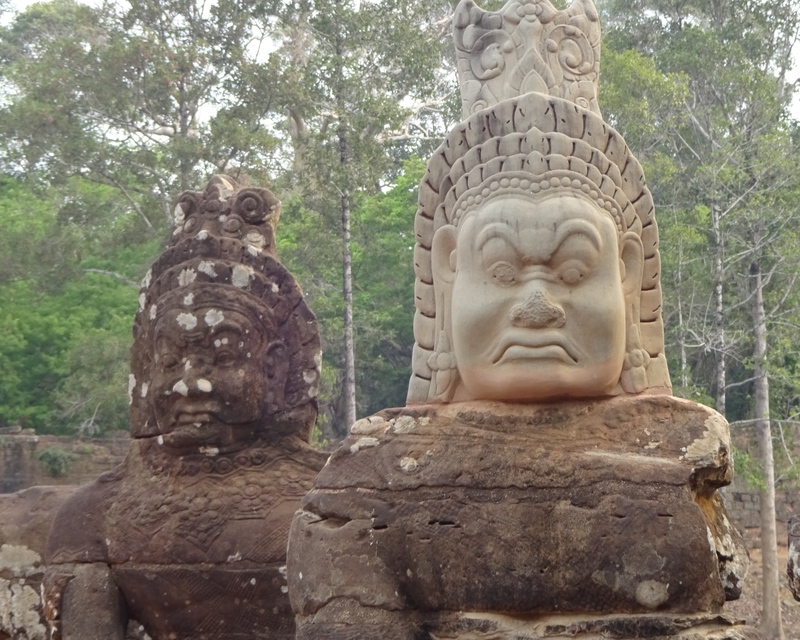 Bayon and Bhapuon. 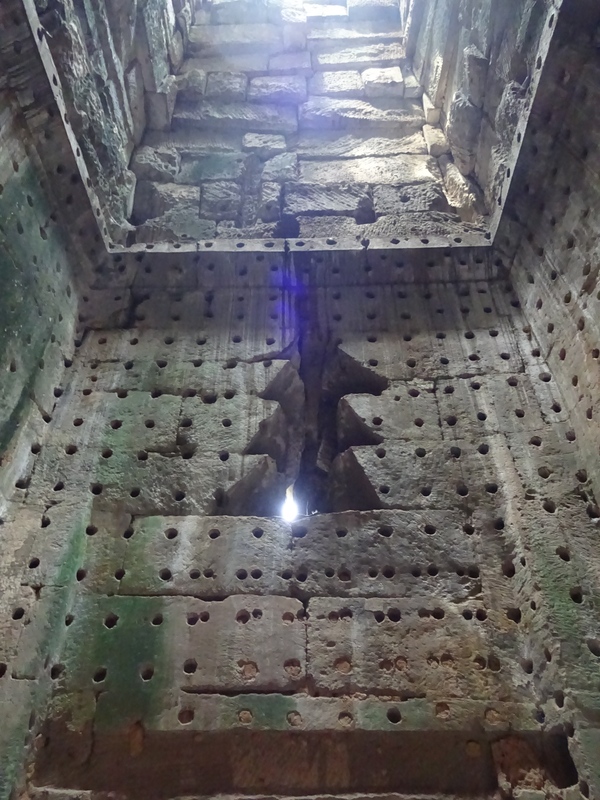 The entrance to Angkor Thom crosses a bridge flanked by 51 demons on one side and 51 deities on the other. 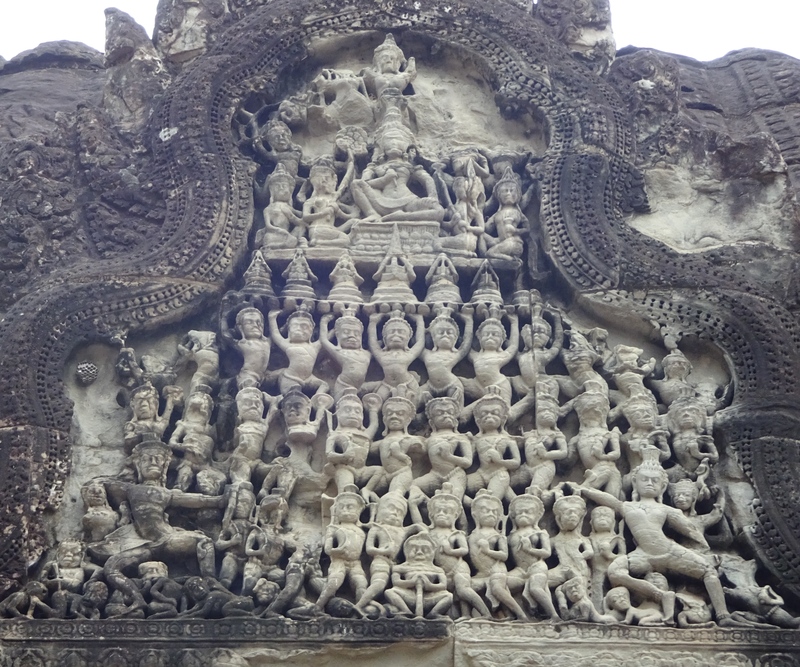 Each group is (or was) holding a seven-headed snake, a Naga, who protects the Buddha. 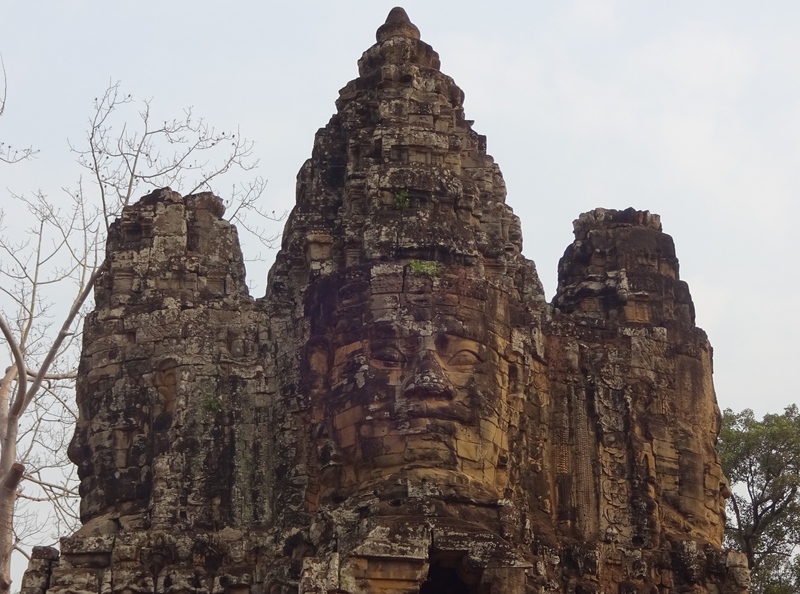 Bayon is known for its numerous four-sided towers, with the distinctive Cambodian rendering of a deity on each face. Each of these Towers is homage to the Four Immeasurables of Buddhism: compassion, sympathetic joy, equanimity and lovingkindness. Before I gave them a dollar. After I gave them a dollar. 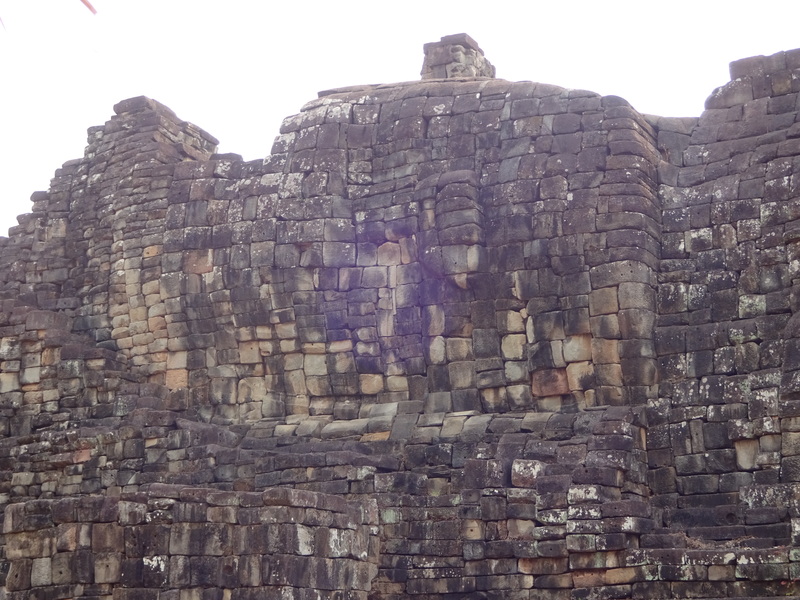 Near Bayon is Bhapuon which means hidden Buddha. The temple itself is not as compelling as the others, but on the backside are the remains of a reclining Buddha 40 meters long built into the wall. 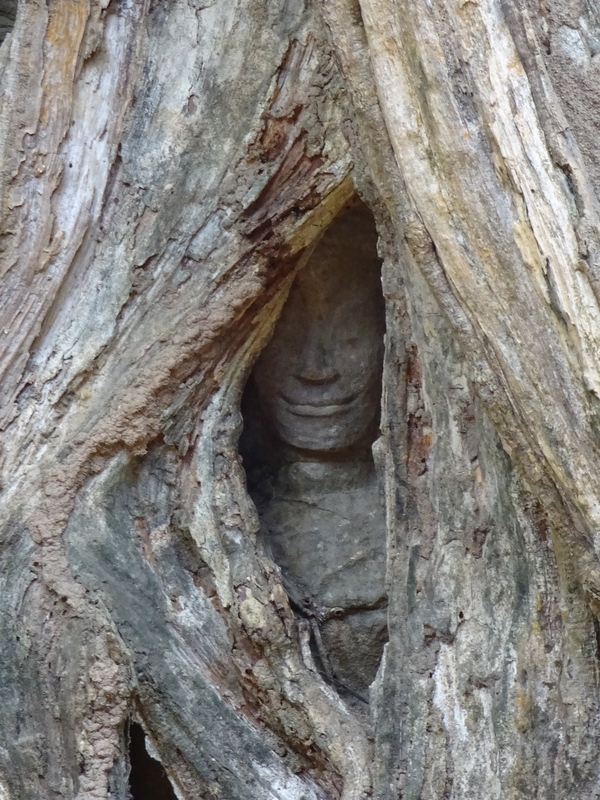 Can you see the face of the Buddha in the stone? 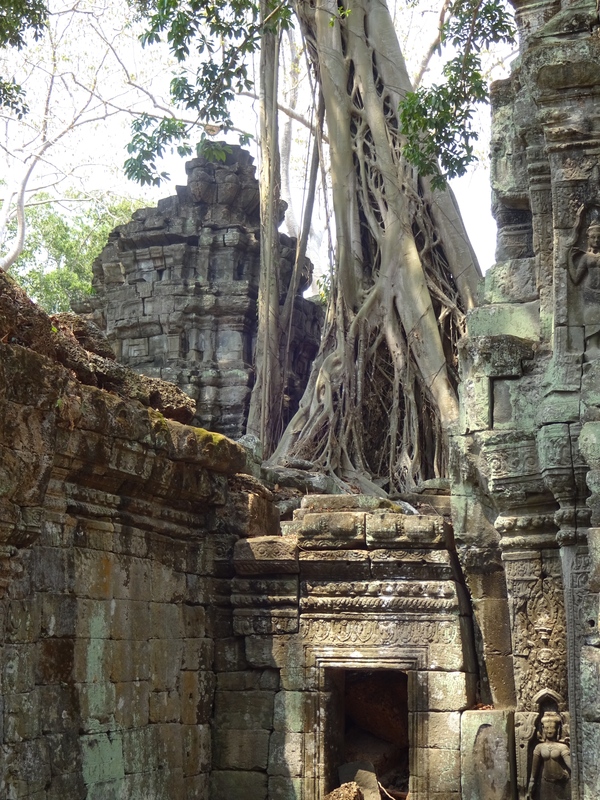 Ta Phrom is much smaller than either of the other two, but is known for being the temple taken over by the force of nature. It’s 1000 years old and has been slowly destroyed by massive root systems that have undermined the integrity of much of the wall structure. The pictures speak for themselves. At one time, this room (about 6 ft square) was the special meditation chamber of the king’s mother. The holes in the wall were filled with gold and precious gems. The light entering from the top created a special effect we can only imagine. The French colonialists stole all the gems. 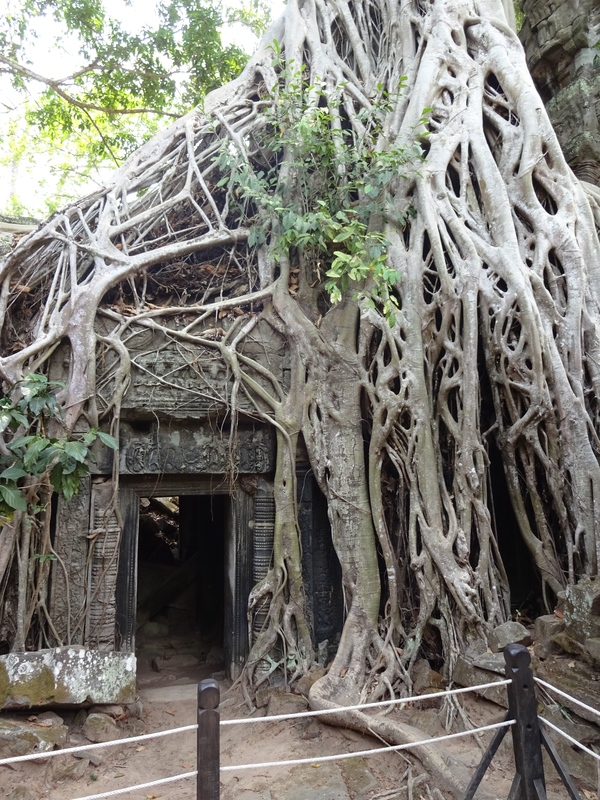 After seeing all the other temples, the only way I could tolerate Ta Phrom was because much of it it is shaded. Otherwise, by that time of the morning, 11 am, the temperature had already risen over 90. 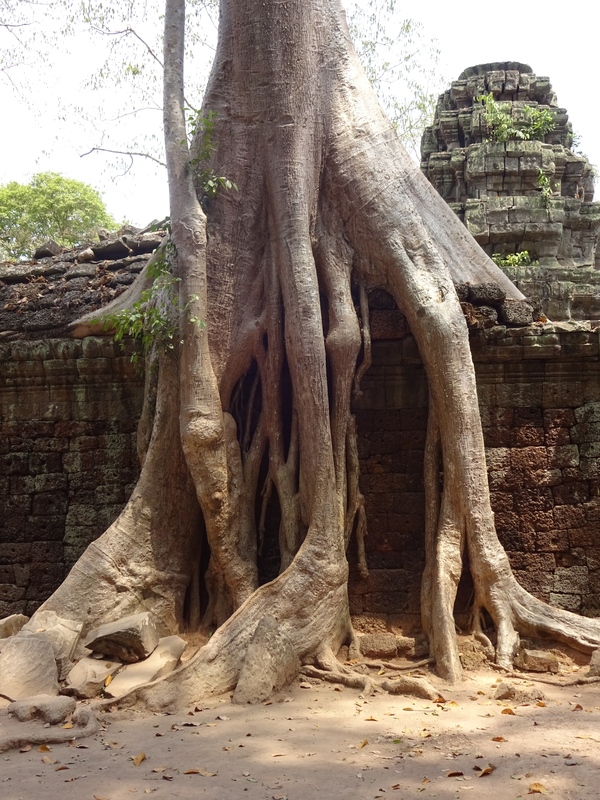 Fortunately, Ta Phrom was also not as crowded as the others, but the tourists were more enthusiastic; everyone, especially the Chinese, needing to preserve themselves for eternity under these trees that, if anything, remind us of the inexorability of change. 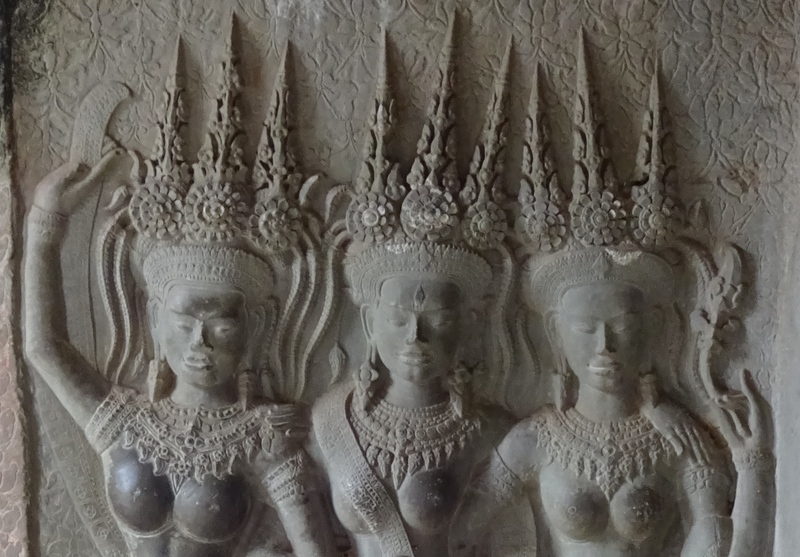 This entry was posted in Buddhism, Cambodia, Travel and tagged Angkor Thom, Angkor Wat, Baphuon, Bayon, Cambodian buddhism, Khmer temples, Mahayana Buddhism, Siem Reap Cambodia, Suryavarmn II, Ta Phrom by garyhorvitz. Bookmark the permalink. What a great post. I loved the humour and smiled broadly at your customs officials and taxi driver anecdotes. Both are absolutely synonymous with travel to far away places. I felt so much déjà vu that I long for my next adventure. As for the tycoon, what can we say? 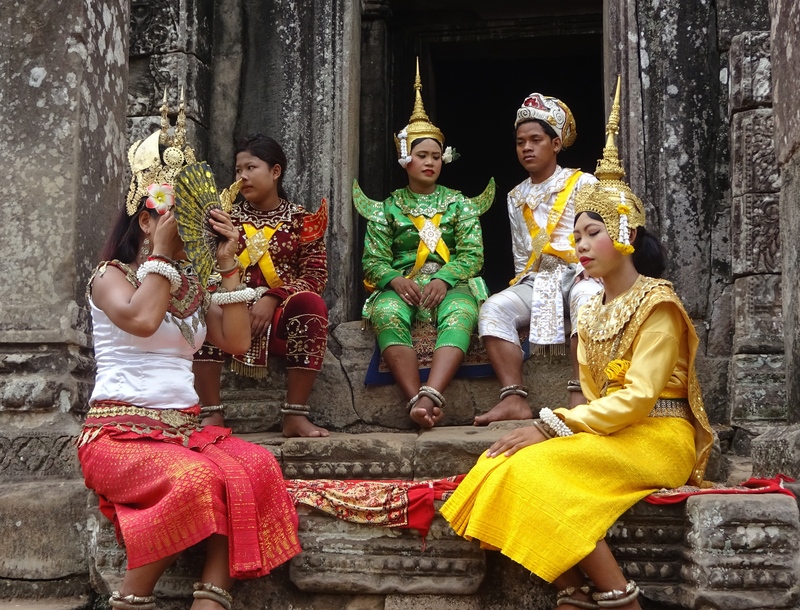 We can say there’s more to come on Cambodia. Thanks, Karen.